For some odd reason Apple has decided to charge users $0.99 for FaceTime for Mac through its Mac App Store.Yes, $0.99 isn’t very much money, but why on Earth is Apple charging for FaceTime? It should be giving it away to anyone that will take it. FaceTime should be open, and available across all platforms, otherwise it’s just going to lose to Skype or some other competitor. 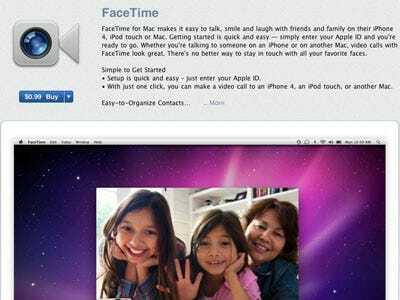 For what it’s worth, it seems like FaceTime will be included free with all new Macs, but if an older Mac wants to add FaceTime, they have to pony up. UPDATE: This is apparently happening for accounting reasons.